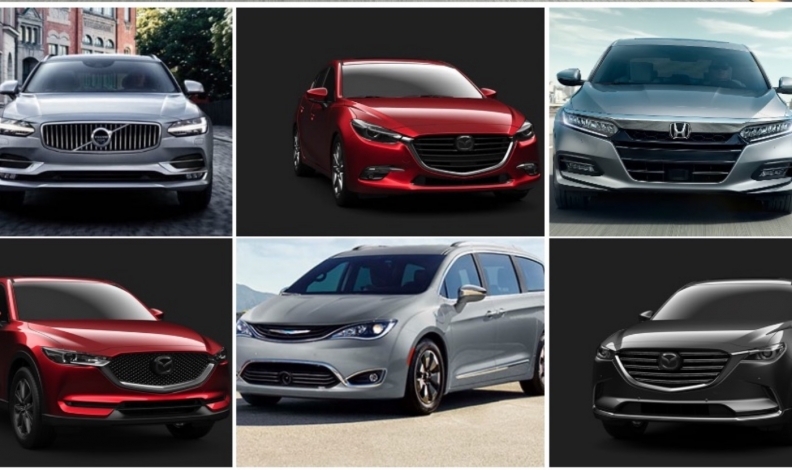 Clockwise from top left are the Volvo V90, Mazda 3, Honda Accord, Mazda CX-5, Chrysler Pacifica and Mazda CX-9. Mazda products represent half the vehicles up for 2018 Canadian Car of the Year and Utility Vehicle of the Year Awards to be handed out at the Canadian International AutoShow in Toronto on Feb. 15. The three car finalists are the Mazda 3, Honda Accord and Volvo S90/V90. The trio of utility vehicle finalists comprises the Mazda CX-5, Mazda CX-9 and Canada-made Chrysler Pacifica minivan. All six will be on stage at 8:15 a.m. on Feb. 15 during Media Day at the auto show. Voting was expanded this year to include all new vehicles available to Canadian buyers, and not just those vehicles new to the market. Previously, only vehicles that were totally redesigned or equipped with all-new technology — and only vehicles manufacturers would pay to enter in the awards — were considered for the awards. That’s not the case this year. For the first time, nearly 100 of AJAC’s voting journalists were able to score vehicles against their direct competition, whether they were all-new for 2018 or returning popular models. The three cars and three utility vehicles were chosen in a separate, previous round of voting by AJAC’s journalists from the 14 vehicles that were named the best in their segments earlier this year at the Montreal Auto Show. The Honda Accord was named Best Large Car in Canada; the Mazda 3 was voted the Best Small Car in Canada; and the Volvo S90/V90 won Best Large Premium Car in Canada. At the same time, the Chrysler Pacifica was chosen Best Minivan in Canada; the Mazda CX-5 won Best Small Utility Vehicle in Canada; and the Mazda CX-9 is the Best Large Utility Vehicle in Canada winner. AJAC members were asked which, of the segment-winning vehicles they’d driven and experienced, most deserved to be named the best car and utility vehicle for 2018.